Local Area Restaurants in Kauai. As the Garden Island, Kauai is well known for its daily farmers markets with fresh fruit juices and smoothies, luaus, and an abundance of fresh fruits and flowers. Try some poi or shave ice or a plate lunch. Lapperts ice cream is a real treat with flavors you will not easily find back home. Kauai coffee, rum, chocolate, and honey are not to be missed, either. Serving unique, healthy and delicious foods from around the world with island, pan-Asian flavors. Homemade entrees, wraps, sauces, salads and beverages prepared with local fruit and vegetables. Vegan and vegetarian items always available. Enjoy the casual dining on the walkway or take to your favorite beach or park. Enjoy the fresh Seafood and American menu with Happy Hour, Romantic, Live Music and Outdoor Dining. Bar Acuda is Kaua�i�s coolest place to relax with friends, share tapas and sip some wine. Chef & owner Jim Moffat�s culinary sensibility originates from the people and food he experienced during years of travel to the Mediterranean regions of Europe � including Southern France, Italy, Spain and Portugal � as well as twenty-five years of honing his craft at his award winning San Francisco restaurants. Over 60 years ago, Walter Smith, Sr. and his wife Emily started this company on the Wailua River with a small rowboat and a borrowed outboard motor. 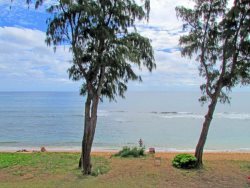 Today, four generations later, the Smith family continues to welcome kama�aina and malihini alike to experience the natural beauty and cultural heritage of Kauai and the Wailua River Valley. At the Bistro our goal is to serve fresh, local, great tasting food while minimizing our environmental impact. We hope that you enjoy yourself in our modest bistro and we have faith that you will take the time to enjoy food, drink and life. Mahalo. The Bistro has been serving the North Shore of Kauai great food and live entertainment in an open air Hawaiian plantation garden setting since 1999. We pride ourselves on using fresh local produce and ingredients to create a unique European, pacific rim, fusion menu. The Gaylord`s Restaurant is located on the grounds of historic Kilohana Plantation, Kauai also known as the Garden Island of Hawaii on Highway 50, 1 mile west of Lihue. Gaylord`s serves Sunday brunch, lunch and dinner daily and is an especially popular choice for the holidays. Gaylord`s extensive wine list is varied in style as well as price, and the full service bar offers premium beers, liqueurs, delightful tropical beverages and non alcoholic beverages. To learn more about us, please take a look around our web site and if you have any questions, we`ll be happy to answer them! Kauai�s freshest and largest variety of seafood and island specialties. An Island Favorite for Over 30 Years. Since the early 1970`s The Dolphin Restaurant has welcomed visitor and local alike to its pristine Hanalei riverside location. Your culinary experience at The Dolphin will include the freshest local produce, fruits, vegetables, seafood and steaks as we are committed to supporting the small Island growers, farmers and fishermen.